Monday, November 9, 2015, 7 p.m. While some philosophers claim that the name of God is “pure being” and some theologians claim that the primary name of God is “the good,” Fr. 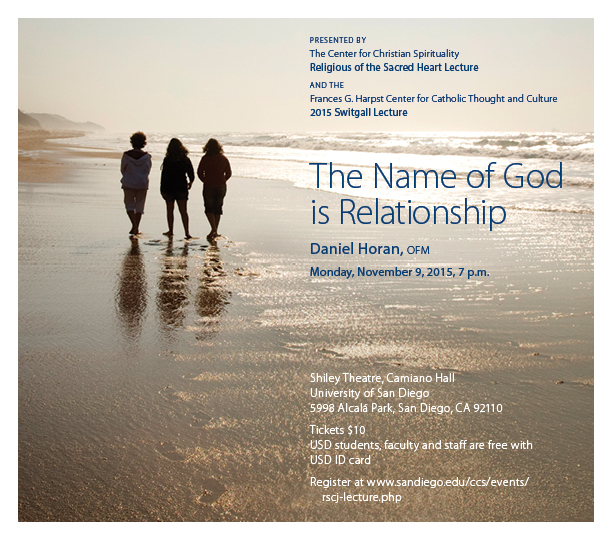 Daniel Horan, OFM suggests that the name of God is best understood as “relationship.” Beginning with the way that God reveals who God is to humanity throughout Scripture and moving to take a deeper look at what the wisdom of St. Francis of Assisi and the spiritual tradition that bears his name tells us about God, this lecture encourages contemporary women and men to reconsider how they imagine their Creator and renew their understanding of faith in the modern world. Daniel P. Horan, OFM, is a Franciscan friar of Holy Name Province (The New York province), a columnist for America magazine, and the author of several books including, most recently, The Franciscan Heart of Thomas Merton: A New Look at the Spiritual Influence on his Life, Thought, and Writing (2014) and Dating God: Live and Love in the Way of St. Francis (2012). He is the author of dozens of scholarly and popular articles in journals and a frequent lecturer and retreat director around North America and Europe. "The Name of God is Relationship"